John L. Armitage & Co. is a privately held coatings and paint manufacturer headquartered in Gallatin, TN. The company has been owned by the Armitage family since its inception in 1876. We manufacture industrial primers for structural steel joist, roof decks, metal buildings and coils. For over 140 years John L Armitage & Co has developed and formulated coating for industrial application in the metal, plastic, and wood industries. Our R&D team prides itself on developing coatings that save you time and money through improved drying and curing times as well as lowering cost through our own resin design and manufacturing capabilities. At John L. Armitage we design and produce custom polymers that are incorporated into our coatings to meet specific performance and environmental requirements and conditions. Our Industrial and Construction coatings are applied throughout North America by leaders in the Steel Joist and Steel Deck Industries in controlled manufacturing environments as well as in the field. This line of Armorhide steel primers insures construction components will be protected during manufacturing, shipping and the erection process. 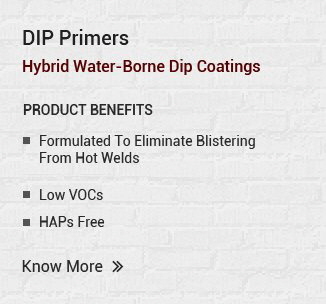 The primers are available in both Water base and Solvent Base technology. Recently we have added resin manufacturing capabilities which makes us very competitive for pricing on water-based primers. Please let us help you put some speed into your production.